This month we are featuring one of our ad hoc members of the Kettering Arts Council! Jan Malson is originally from Wisconsin and a graduate of Beloit College. Her career was in Girl Scouting with councils in Akron, Wheeling and Dayton as a camp counselor, waterfront director, canoe trips director, resident camp director and field services/membership director. She has three children and four grandchildren. 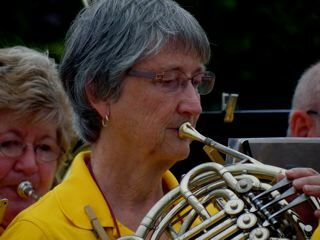 Her hobbies are quilting, reading, traveling, volunteering at church, and playing French horn in the Centerville Community Band and the Kettering Civic Band. Each month, she discusses the activities of the Kettering Civic Band with the Kettering Arts Council, including concerts taking place all over the Miami Valley!